Dr. Maggie O'Haire, assistant professor of human-animal interaction in the Department of Comparative Pathobiology, with her dog, Chloe, and Jason Snodgrass, chief operating officer of K9s For Warriors, which is partnering with Dr. O'Haire on a study of the effects of service dogs on veterans with PTSD. A new clinical trial, led by the Purdue University College of Veterinary Medicine's Center for the Human-Animal Bond, hopes to quantify the effects and role of service dogs for military veterans with post-traumatic stress disorder (PTSD). Dr. Maggie O'Haire, assistant professor of human-animal interaction in the Department of Comparative Pathobiology, is leading the research and says that, although the prevalence of service dogs for PTSD appears to be on the rise, there are no published clinical trials available to validate their efficacy. "Many veterans are increasingly seeking complementary interventions for PTSD, including service dogs," Dr. O'Haire said. "Yet, even with the well-meaning intentions of service dog organizations that are working to meet the demand, our systematic review of scientific literature confirms a lack of published, empirical research on the effects that service dogs have on veterans and their spouses." Dr. O'Haire explained that, historically, research in this area has relied on anecdotal evidence and emotion rather than science. "Without scientifically sound studies that establish proof-of-concept for the therapeutic efficacy of PTSD service dogs, this animal-assisted intervention strategy will continue to be minimized as an unsupported and potentially unsound practice, despite anecdotal reports that the dogs may have a significant impact," she says. 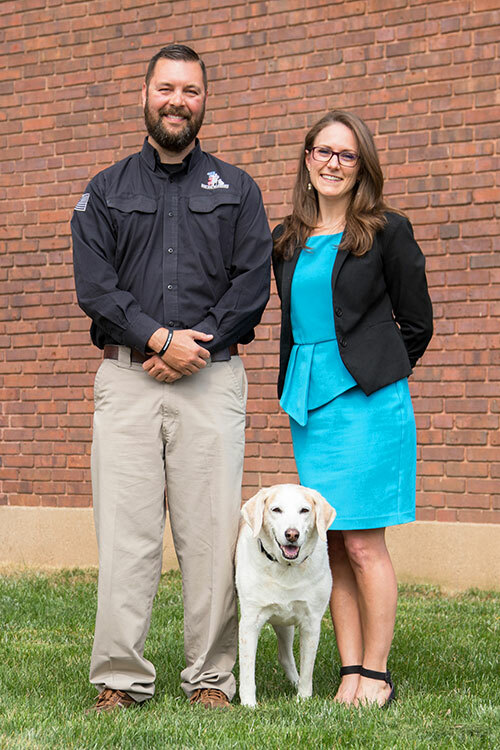 The research led by Dr. O'Haire will create a scientific evidence base for the effects of service dogs on veterans with PTSD as well as their spouses. The study will be conducted in partnership with K9s For Warriors, one of the nation's largest providers of service dogs to military veterans suffering from PTSD, traumatic brain injury and/or military sexual trauma as a result of military service post-9/11. The study is being funded by a $275,000 grant from the National Institutes of Health (NIH) Eunice Kennedy Shriver National Institute of Child Health and Human Development (NICHD) and the National Center for Complementary and Integrative Health (NCCIH). The funding is part of a public-private partnership established in 2008 between NICHD and the WALTHAM Centre for Pet Nutrition to establish a human-animal interaction (HAI) research program to support studies related to child development, health, and the therapeutic inclusion of animals in interventions for individuals with disabilities or those requiring rehabilitative services. Merrick Pet Care, a strategic research partner of K9s For Warriors, is also a major supporter of the study, contributing $250,000 to the project. Dr. O'Haire and her research team hope to learn how service dogs are incorporated into the lives of veterans and what changes they may confer in terms of PTSD symptomology, social functioning and physiological biomarkers. They will use standardized survey instruments as well as objective measures of physiology to track stress and functioning. They also will use a novel ecological momentary assessment protocol to capture the role and function of the dogs in everyday life. "This project represents a substantive departure from the status quo by applying rigorous research methodology to an area that has historically been characterized by a reliance on emotional intuition rather than evidence-based science," Dr. O'Haire says. "The NIH funding, coupled with the additional private support, provides the resources needed to conduct a methodologically rigorous clinical trial." Purdue issued a news release about Dr. O'Haire's research earlier this week, and since then several news outlets have carried the story and interviewed Dr. O'Haire, including WISH-TV in Indianapolis and WBAA Radio.